False-colour scanning electron micrograph of a number of "killer" T-lymphocytes. These white blood cells play a role in the cell-mediated immune response which the body puts up to invasion by foreign micro-organisms (notably viruses and some bacteria, which are protected from antibodies by their host cells). T-cells recognize antigens on their target cell and release enzymes that disrupt its cell membrane, causing its destruction. 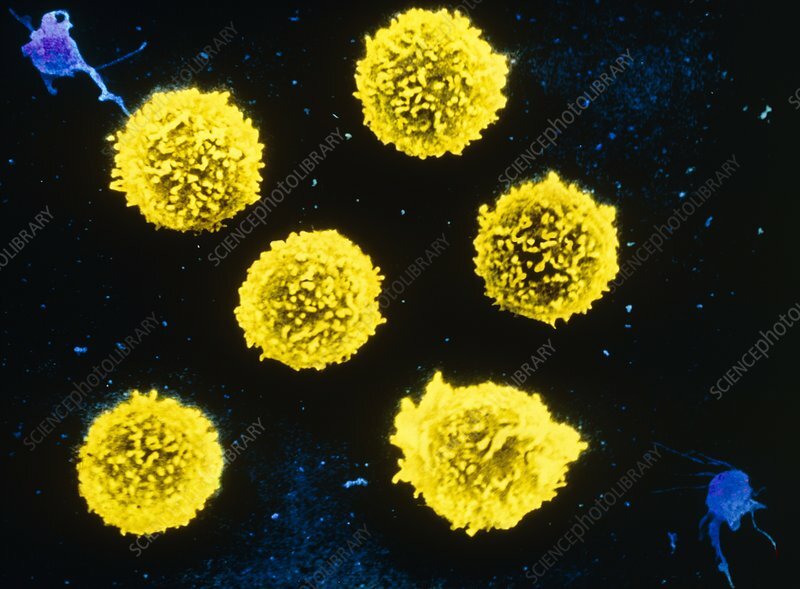 The lymphocytes in this picture are about to be cultured with the drug Interleukin-2; the resulting lymphokine-activated natural killer (LANAK) cells are used in immunotherapy to fight cancer. Mag: x6700 at 5x7inch, x2800 at6x7cm size.